I thank each and every one of you for making my dreams real. Love is the most important thing. I am grateful for yours and please know, you have mine. Happy Holidays and Happy New Year 2018. Below is a message Jim shared with the cast of Bat Out Of Hell The Musical on their opening night in London. He asked that it was also shared here, now. Lie #1 "You have to grow up." Lie #2 "Life is short." The latter bolsters the former. Neither are true and believing in either (or both) will hurt you. We all grow old, with a bit of good fortune, but that doesn't mean we are required to view the world differently than we did in our younger years. Life is also far from short. Don't needlessly rush toward an imaginary "finish line" dictated by convention and rule. Determine your dream and constantly do things that move you in it's direction while taking time to enjoy the road along the way. Some years ago I was asked to musicalize this book, The Little Prince by Antoine de Saint-Exupéry. Although the project was not realized, I was profoundly moved by some of the incredible similarities it shares with my own vision and message, albeit in an entirely different format. By total coincidence both Saint-Exupéry and I utilize a crash to begin our narrative, the burning stars above to symbolize life, a rose and an important "yes or no" question to be answered by the audience. Andrew Polec bears a striking resemblance to The Little Prince so, yet another coincidence was recently revealed to me - my Strat and Saint-Exupéry's Prince look like brothers! That's a large part of the reason the book has been on my mind and why I share it with you now. Grow spiritually but don't "grow up"
My gratitude towards each of you is beyond even my power of expression. You are the beautiful friends I have somehow always known and been waiting for. I thank every member of the cast, creative team, production and management from the bottom of my heart. You have made my dream a reality. You have made me happy and proud. I want, wish and pray the same for each of you. When you need it the most, like I do now, may your rock n roll dream come through. ps - This book is in paperback form not for thrift or economy. I would have much preferred to gift you the hardback. This version, however, is the original translation and it's no longer sold in hardcover. It is so much more poetic and beautiful than the current translation on sale now. Another lesson as to the care needed when approaching a classic piece of art, loved and taken personally the worldover. And another debt of gratitude from me to all of you. The fact that Bat Out Of Hell's deepest and most passionate fans love and embrace Bat Out Of Hell The Musical is a testament to how poetic and beautiful our translation has been. We've done the near impossible, my friends - faithfully translated a classic for new generations to discover. For that, I thank you. Have you checked out The Dream Engine section of this website recently? Script as of April 1969 - as it was on paper before the show was staged. There were some significant changes! The Bat Out Of Hell musical cast album is up for an award - the Curtain Up Show best album award (UK musicals). If you happen to be in the UK there's also a £100 "TodayTix" theatre voucher up for grabs for voting. Good luck! Voting is open until 5.00pm GMT on Wednesday 10 January 2018, and winners will be announced live on Resonance FM at 4.00pm GMT on Friday 12 January 2018. Tickets for Bat Out Of Hell - The Musical at the Dominion Theatre in London are now OPEN. The run starts on April 2nd and shows are 19:30 (7:30pm) Mon - Sat with matinees on Wednesdays and Saturdays at 14:30 (2:30pm). Box office phone (the expensive number): 0845 200 7981 - calls cost 13p per minute plus network extras available 24 hours a day. Box office phone (the slightly cheaper premium-rate number): 0845 200 7982 - calls cost 2p per minute plus network extras. Box office phone (the normal-rate number): 02072920900 - normal London phone charges, open during office hours only. Sorry for not posting ticket details on Monday. The queuing system for tickets that day was very, very busy. Some folks were in online queues 1500+ people long. They sold a lot of tickets though - they took in £350,000 and broke the box office record for first day sales at the Dominion! Bat Out Of Hell has won the award for Best Musical at the 63rd annual ES Theatre Awards in London, beating shows such as Dreamgirls, Follies, and An American In Paris. The award was voted for by the public (yay, go us!). The ceremony took place last night at the Theatre Royal, Drury Lane, and the award was graciously received by Andrew Polec and Christina Bennington, who had flown back to England from Toronto to receive the award. "We're so delighted to be representing what is really 60... 70... 80... 90 hard working, incredible people of this team. So it's really a 'Well Done' for all of them and it's fantastic to be here", Christina said, speaking on BBC Radio 2. "Yeah, all their blood, sweat and tears, and it's a huge, huge thank you to all of our fans - I mean, throughout the generations. They have been so lovely in supporting this show, singing at the top of their lungs when they come to see the show" - Andrew Polec continued. Ken Bruce (host): "But there's something about the music of Jim Steinman. Did know much about his songs before you took part?" Christina: "I think what's wonderful is - I heard the music of Jim Steinman and Meat Loaf through my parents. It was driving anthems and that kind of thing, and I think we see that reflected in our audiences; we get people who this music means so much to them and they have nostalgia for it because it's been 40+ years that they've been listening. And we have 18 year-olds who come and they relate to it. We have multi-generational family trips. And that's what's so incredible. This music reaches out and grabs you by the heart and soul and gut, no matter what age you are." "It's a huge honour for all of the cast to be given that responsibility, and especially to be taking the baton from the legend that is Meat Loaf. Everyone has such a love for him and his voice and his energy, and Andrew along with the rest of the cast have got that challenge of giving it their own spin"
Bat Out Of Hell the Musical has been nominated in eight categories at the WhatsOnStage awards. Voting is open now until January 31st. 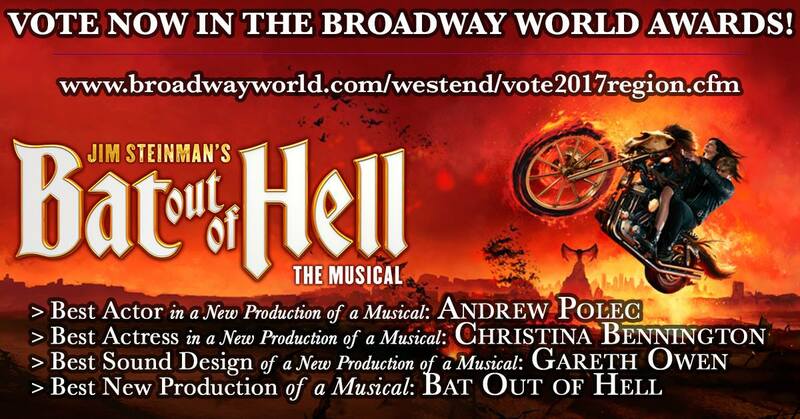 Show your support and vote for BAT OUT OF HELL! Bat Out Of Hell the Musical returns to London, taking residence in the Dominion Theatre running from 2nd April 2018 onwards. 'It's a good love story,' said Michael Cohl, the rock promoter turner theatrical producer, speaking from his office in New York. He and his associates took the ENO production to Toronto, where it's currently playing to packed houses. He hopes it will tour North America later next year, perhaps revisiting Toronto again. Cohl and Julian Stoneman, the show's general manager, said negotiations have begun, with the hopes that Andrew Polec and Christina Bennington, who originated the roles of Strat and Raven, will play them at the Dominion. Rob Fowler and Sharon Sexton, who played Raven's parents, are also in discussions about the West End return. Nominations are open for the 18th annual WhatsOnStage awards. "The only major UK theatre awards in which you, the audience, are the judges"
Does that sound to you like an invitation to vote for Bat Out Of Hell and its cast and creatives in every category possible? Me too! Let's get voting! After the nomination period, voting opens December 1st and closes January 31st. Winners announced 18th February 2018! A new Bonnie Tyler compilation is coming out on November 24th - a 2 CD collection called "Bonnie Tyler - Remixes and Rarities"
Sixteen more performances will be added, all during the high-demand holiday season, December 27 to January 7. To accommodate the holidays, a special schedule that includes more matinees has been added. Tickets to the new extension performances will go on public sale on Monday, October 30 through mirvish.com, over the phone at 416-872-1212 or 1-800-461-3333, and in-person at the Ed Mirvish Theatre box office, 244 Victoria St.
As announced by Elaine Paige on her show on BBC radio 2, and in the Evening Standard newspaper, BAT OUT OF HELL has been nominated for best musical in the Evening Standard Radio 2 Theatre Awards 2017 for "Best Musical"! I know you've all been asked to vote a lot already, but this is the biggest and most prestigious award the show has been nominated for so far, so please, please help, and show your support! If you've got a BBC website login and you're in the UK - it's just one button to click. As always, we need all the votes we can get! The track listing is intended to be the most complete it can be, including the songs “It Just Won't Quit” and “Good Girls Go To Heaven”, which were included the show, but are now gone (to make way for the full version of “Out Of The Frying Pan”) - fans still love the songs and wanted them to be on the album, so here they are. The CD is out now in Canada (at the theatre and on Amazon.ca) and should be released on 20th October elsewhere. The specific release dates are in the hands of the publishers and distributors. The album should also come out on digital (iTunes etc) but we've heard no confirmation so far. For more info: there is a fan wiki page about Bat Out Of Hell The Musical : Original Cast Recording, with full cast and recording credits and is being frequently updated with where you can buy the CD as we spot more shops listing it! The vote is public, so please support BAT OUT OF HELL with your vote! Voting open until Friday, 8 December 2017. You will need to enter an email address to vote. Read more about the shortlist here. Due to popular demand, producers David Sonenberg, Michael Cohl, Randy Lennox and Tony Smith are excited to announce a three week extension for the North American Premiere of Jim Steinman's BAT OUT OF HELL THE MUSICAL. The show will now run from October 14th - December 24th, at the Ed Mirvish theatre, Toronto. Tickets are available from their website, or by phone at TicketKing at 416-872-1212 or 1-800-461-3333. Group orders of 10 or more save 25% and may be placed by calling 416-593-4142 or 1-800-724-6420. Please support the cast and crew of Bat Out Of Hell The Musical by helping them win the awards they so deserve, by backing them in these public votes. Andrew Polec has been nominated for "RISING STAR" in his role as STRAT in Bat Out Of Hell The Musical in this year's The Wilma Awards. And you can vote for Bat Out Of Hell The Musical in multiple categories in the Broadway World Awards. Massive congratulations to Andrew Polec for winning in this year's The Stage Awards - the Joe Allen Award for Best West End Debut. No-one is more deserving. And thanks to all who voted! Christina Bennington (pictured left) accepted the award on Andrew's behalf and told the BBC: "This category was absolutely ridiculous, and it just goes to show that Bat Out of Hell has the best fans in the world". Our wild child Strat has made the shortlist for the Joe Allen Best West End Debut Award. Vote for Andrew Polec as your "favourite West End debut" here! Public voting is open until September 10th. Spread the word! We've also got a Facebook group called Jim Steinman's Rockman Philharmonic Deep, Deep End discussion group, if you want to join in (lurkers are welcome too! ).